You still have time to enter the Name That Sheep Contest! You could win a sheep! Oh, yeah. I'm first. I rock. Is Dan tired of looking after all those sheep? He looks like he wants to escape! Is he satisfied with his new charges ? He seems want to say us " But what what I make here " ?!!! Hi FG, Dan is so cute!! You never told me about the A&B names?? Good Morning! Dan looks like a teenager babysitting a group of kindergartners! He has that "I am so getting out of her in an hour and going to the beach!" look on his pretty face! 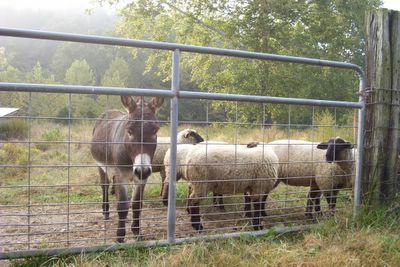 Dan looks good to me, not in the least unhappy about his "new charges".. more in fact pleased that he can be a good donkey and keep the sheep safe. Have a great day! He's plotting something, isn't he? Watch out, farmgirl! Hi Susan - I replied to you on my blog but I'm still not totally sure how this works, so I'm responding to you here, too! Thanks so much for checking out my blog - it's pretty new so I am thrilled that someone has seen it! I love the 4th story - I remember getting up here on my first 4th and asking my parents what all the fuss was about. My father jokingly refers to Independence Day as the "British Thanksgiving"!!! I had a great time looking through your site - we had a mini-farm in Gloucestershire for a little while when I was a kid (and my parents were going through a major self-sufficiency phase). It was great fun - although we had a goat instead of a donkey! If it's okay with you I'm adding your site to my links! I think Dan might be a bit crotchety, but that's just me. So glad you enjoyed this picture. I was hoping to capture some of Donkey Doodle Dandy's personality, and from your comments, it appears that I was successful. And while we all agree that there is obviously something going through his mind regarding these new living arrangements, we don't actually know what it is, do we? Is he bored? Is he happy? Is he dreaming about escaping to the beach? Is he plotting something? I suppose I should just ask him. I'll let you know tomorrow what he says. Do you actually think I would let you suffer this long? I answered the A & B name thing days ago, but unfortunately you missed it. It's here about halfway down the comments section. That's so ironic about your dad and the "British Thanksgiving" after I told you my little story. Too funny. I'm glad you enjoyed your visit here. I never mind at all when someone wants to put up a link to Farmgirl Fare--I'm always flattered. Link away! Thanks Susan! I appreciate your comment on my blog! Regards, Sonia.